Courtesy of © The Liam Peters Collection 2010. 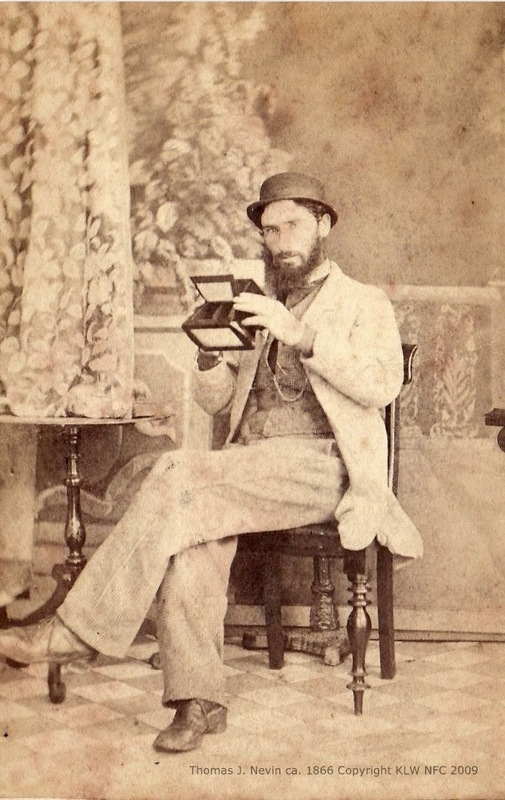 This deft and lightly hand-tinted photograph of a bearded young man wearing a check-pattern summer jacket was taken by Thomas J. Nevin in early 1868 while operating with partner Robert Smith as the firm “Nevin & Smith” at Alfred Bock’s former studio, the City Photographic Establishment, 140 Elizabeth St. Hobart Town (Tasmania). 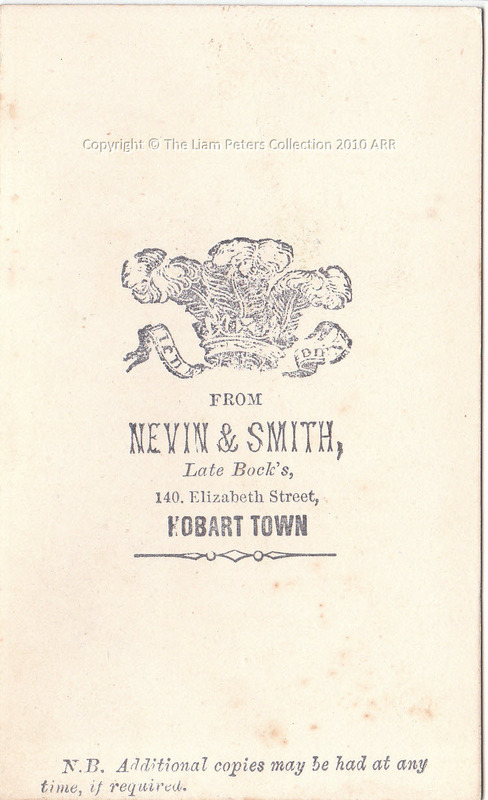 The photograph was taken no later than February 1868 because Nevin’s partnership with Robert Smith was dissolved by solicitor W. R. Giblin per the Mercury notice of 26th February . The occasion for both photographers and their sitter, as indicated by the Royal feathered insignia incorporated into the studio stamp on verso, was the visit to Hobart of Prince Alfred, the Duke of Edinburgh, the second son and fourth child of Queen Victoria and Prince Albert, in command of his yacht the Galatea, arriving on 6th January and departing for NSW on 18th January 1868. 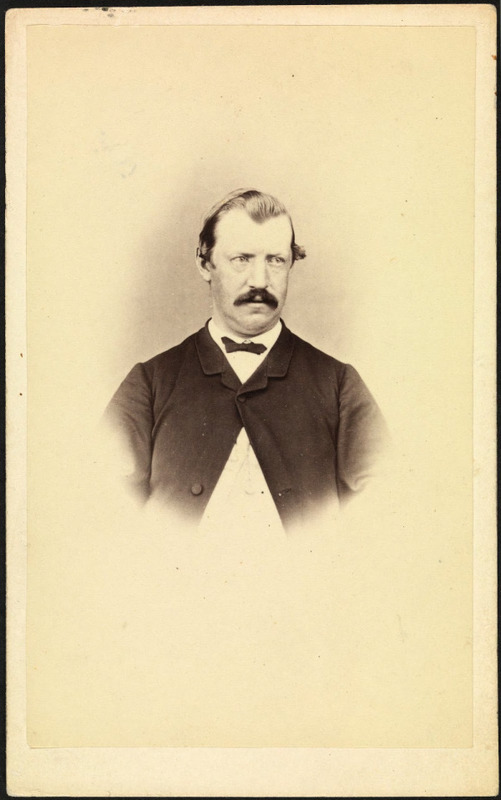 At his final reception, he was presented with an album containing “eighty-three photographs illustrative of the scenery of Tasmania, forty-eight portraits of children born in the colony, and nine plates immediately connected with the Prince’s visit” according to the account largely derived from local newspaper articles, Narrative of the visit of His Royal Highness the Duke of Edinburgh to the colony of Victoria, Australia, pp 200-210, published in 1868 by John George Knight. 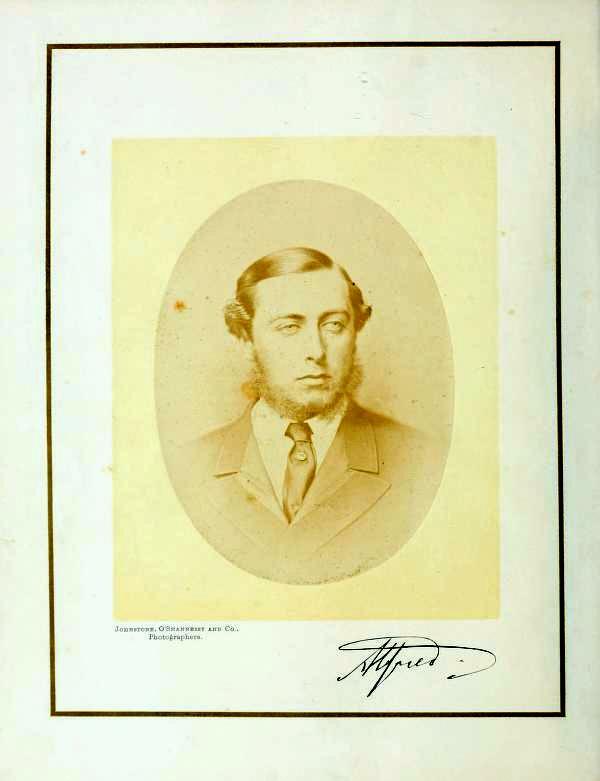 The Prince’s photograph prefacing this edition shows a Royal preference for a style lightly whiskered around the chin and cheeks. Rapid progress from the shaved face of the 1850s to a bearded appearance, which started during the Crimean War, reached its peak in the 1870s. 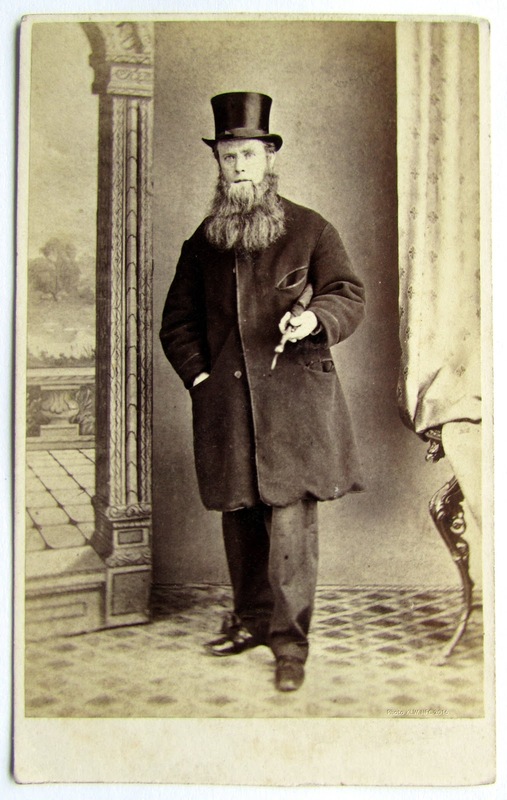 Designated by Victorian Britons as the”beard movement”, it promoted an ideology which contended that a beard represented elemental masculinity. Potential health benefits were touted for the beard: it acted as a filter against disease, capturing germs and protecting teeth, especially where men employed in mining and industry were assaulted daily with dust and rubbish. The beard also provided other benefits such as a healthy skin, protection from sunburn, and a means to keep warm in winter. Those who adopted this love of beards were labelled “pogonophiles”. 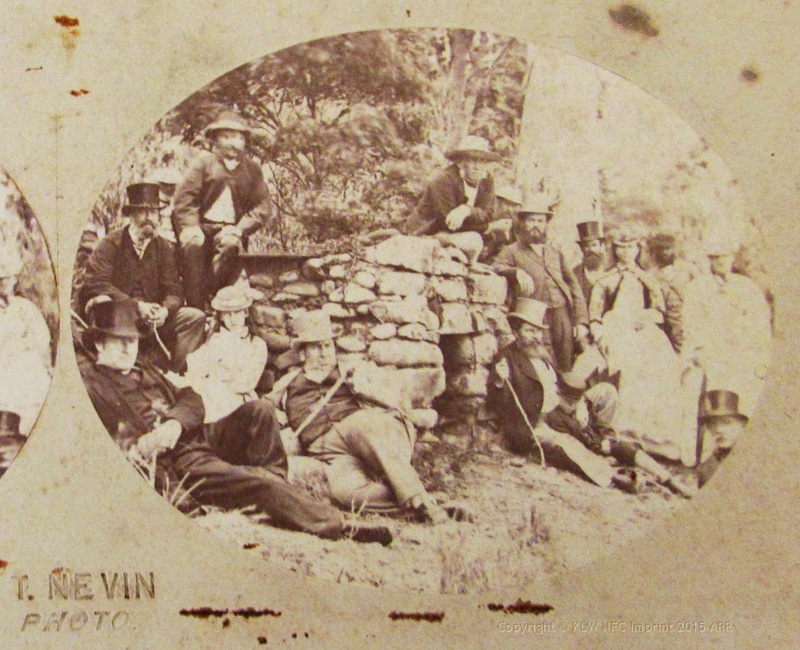 When Thomas J. Nevin married his fiancee Elizabeth Rachel Day in July 1871, his three male wedding guests posing for this photograph (below) preferred neatly trimmed beards and thin moustaches in similar fashion to Prince Alfred. 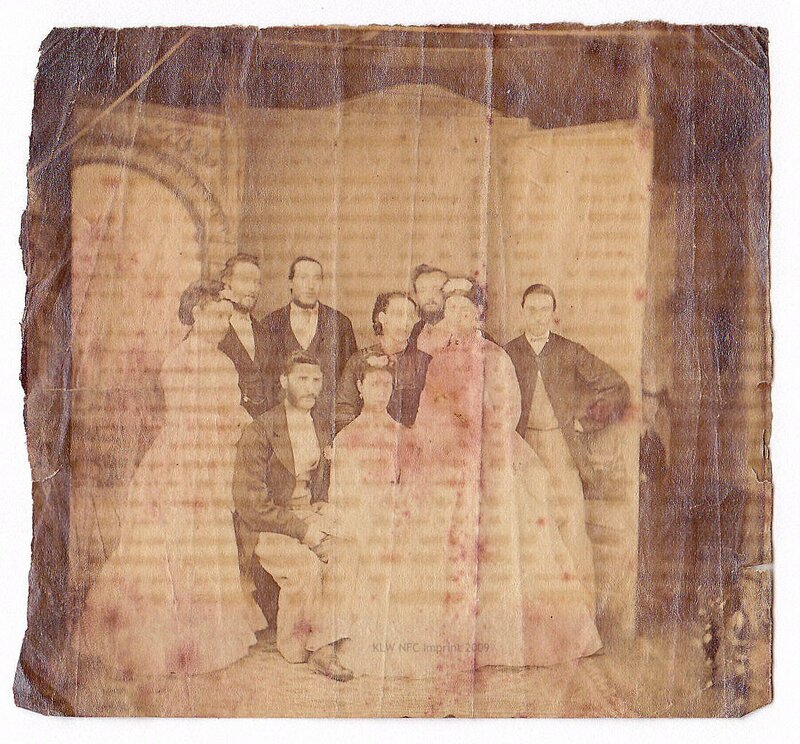 Younger brother Jack Nevin, standing on extreme right, and still a teenager, had grown a moustache by 1871, and kept the style when photographed ca. 1880, by then Constable John Nevin, and still beardless. 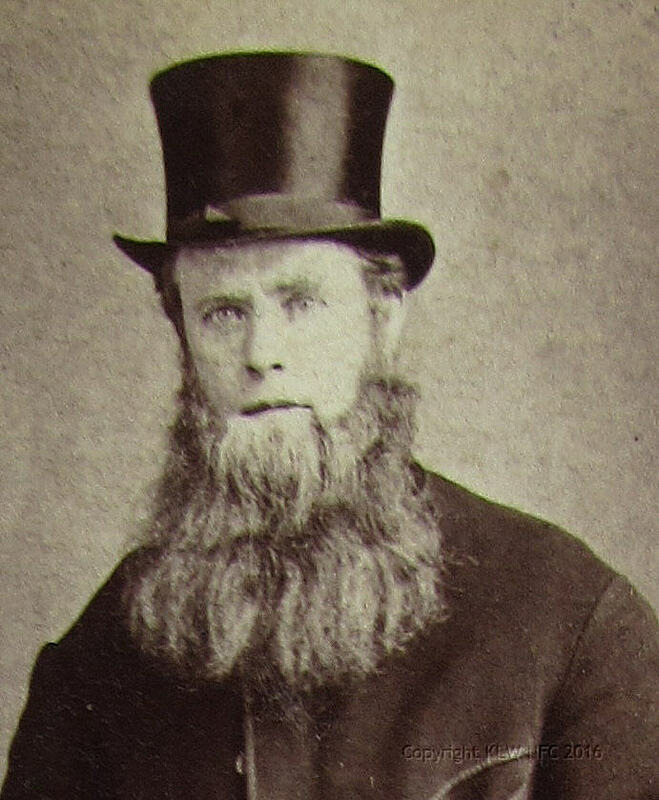 Thomas Nevin, seated with Elizabeth, wore mutton chops and no beard for the wedding in 1871 but photographs taken of him in the late 1860s and again in 1874 show his preference for the beard, reddish to the last, as remembered by his grandchildren in the 1920s. A cursory glance through dozens of commercial portraits taken by Thomas J. Nevin of his male clientele in the 1870s gives the impression that eight out of ten men – 80% no less – preferred some sort of facial hair, from a simple moustache, as was the case with his solicitor, later Tasmanian Attorney-General W. R. Giblin, to degrees between the moustache complimented with mutton chops to the massive full beard, the possession of life-timers. The life-timer: this young man has a full beard and looks likely to keep it. A wave at the spot in front of his top button suggests he customarily either tied it in a tail or tucked it into his jacket. Although unidentified, he may have been John Hamilton, who worked in Askin Morrison’s shipping firm in 1871 and later established the firm of John Hamilton & Co., merchants, shipping, commission and insurance agents. 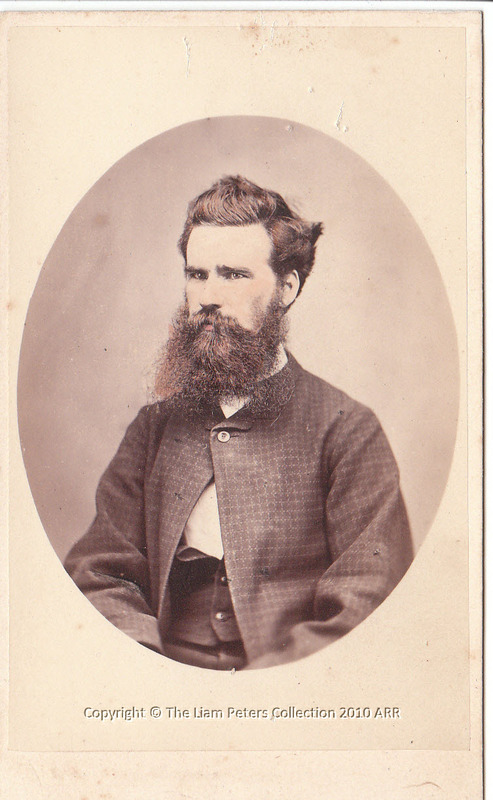 See this photograph of John Hamilton taken in later life with remarkably similar eyes and beard pattern. Among free men, that is, apart from those prisoners Thomas Nevin photographed when they had shaved and dressed in prison issue on being incarcerated, factors such as class or age do not seem to differentiate those with beards and those without. For example, the two clean-shaven men in this photograph are the former Premier Sir John O’Shanassy in a white top hat on the viewer’s extreme left, and a working class man in a narrow brim floppy white summer hat on extreme right. 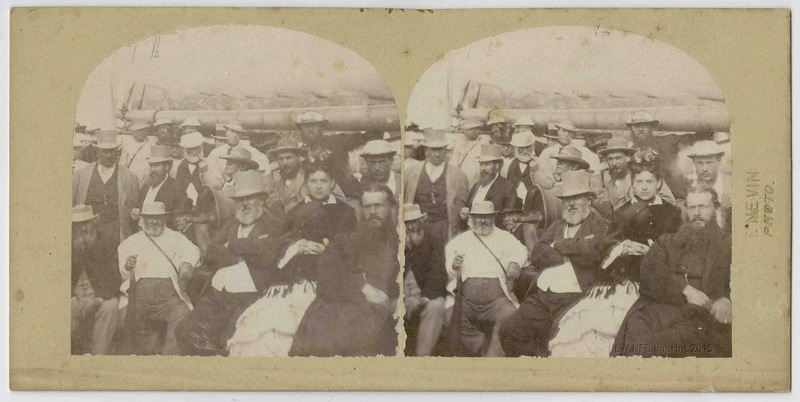 Thomas Nevin took this photograph of intercolonial and local VIPs in the company of colonists on board the City of Hobart, January 31st 1872 during an excursion to Adventure Bay, at Bruny Island. 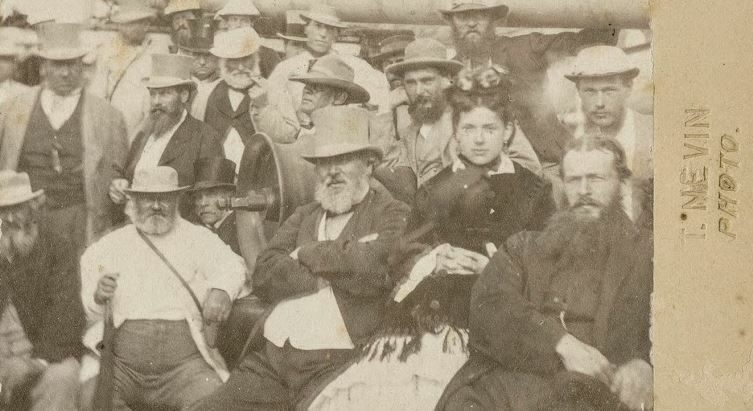 The bearded men in the foreground included barrister Byron Miller standing next to O’Shannasy, Captain Clinch with pipe behind him, the Premier of Tasmania the Hon. Alfred Kennerley, front centre, arms crossed, the Hon. James Erskine Calder (face next to the Capstan wheel), and the Rev. Henry Dresser Atkinson at extreme lower right. The calm young woman in this hirsute crowd remains unidentified, although in all likelihood she was Sarah Ann Ward, Rev. Atkinson’s fiancée. Verso with T. J. Nevin’s government contractor’s stamp with Royal Arms insignia. 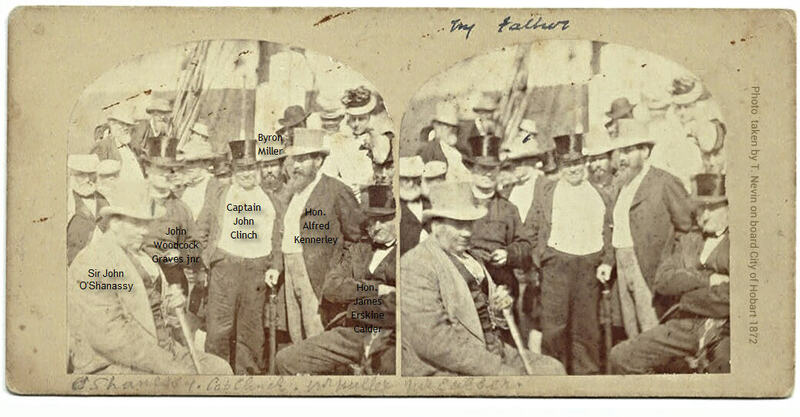 Above is another photograph of the VIPS and colonists taken by Thomas Nevin on board the City of Hobart, 31st January 1872. The same bearded VIPS appear in this photograph. Two exceptions are pictured here, both clean-shaven and socially advantaged, both wealthy and powerful – Sir John O’Shanassy and solicitor John Woodcock Graves, reclining in this photograph also taken by Thomas Nevin on the Adventure Bay excursion. Captain William Langdon, R.N. 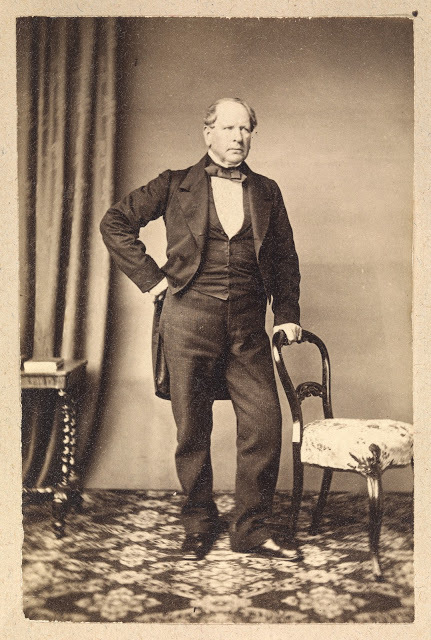 and later Member of Parliament also preferred the clean-shaven look for this unattributed photograph dated no later than 1870, but his parliamentary colleague the Hon. W. R. Giblin, A-G and later Premier, photographed by Nevin ca. 1874, preferred the beardless look complimented with a midly assertive moustache. Above: Captain W. Langdon (on left) and Hon. W. R. Giblin (right). 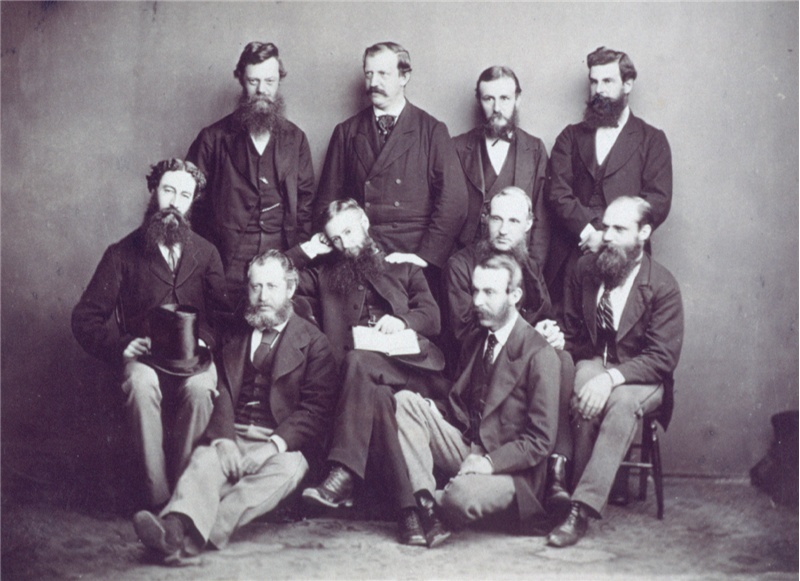 Below is another photograph of W. R. Giblin, top row, second from left, surrounded by lawyers, politicians and administrators, probably members of the LOYAL UNITED BROTHERS LODGE, A. & I.O.O.F. 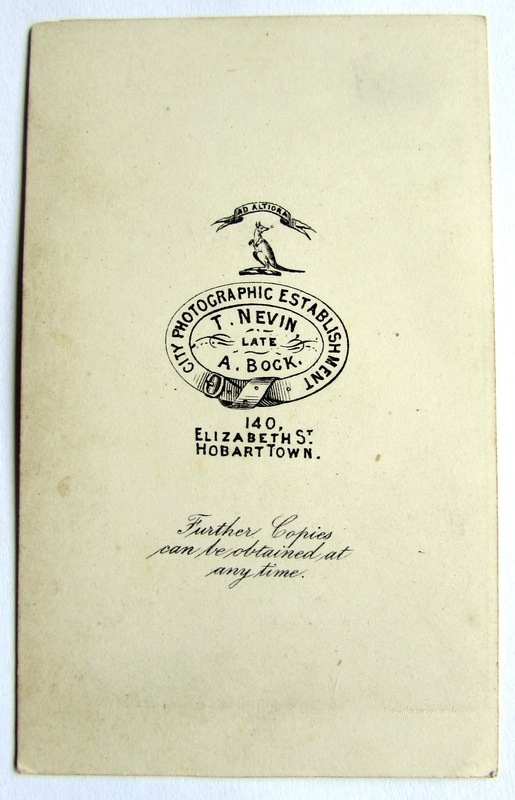 (Australian and International Order of Odd Fellows) for whom Thomas Nevin was the official photographer when he photographed the new Odd Fellows Hall and members who attended the opening in 1871, among various other functions. All except Giblin in this photograph favour the beard. 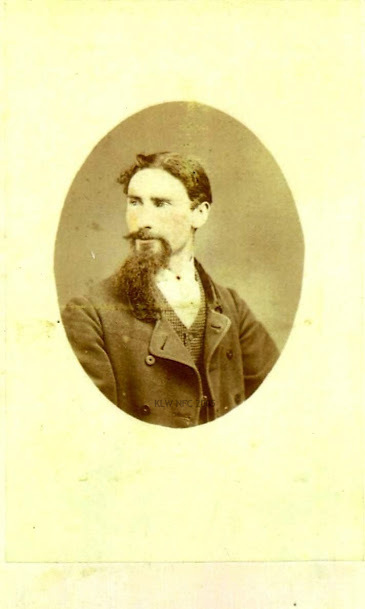 Thomas Nevin’s father, John Nevin snr photographed here by his son Thomas. By 1879 he preferred a rounded beard covering the cheeks but sitting clear of the lips and minus a moustache. 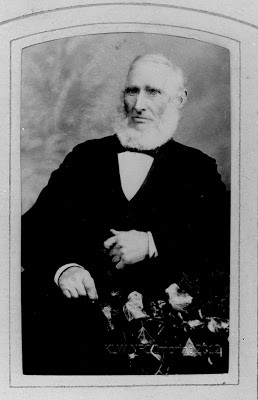 John Nevin senior (1808-1887), photographed in 1879, aged 71 years, on the occasion of his marriage to his second wife, Martha Genge (aged 46 yrs). Thomas Nevin’s brother, Jack Nevin developed his beardless style in his teens, and stuck to it. Carte-de-visite on buff mount. Verso is blank. Thomas Nevin and Elizabeth Rachel Day, July 12, 1871. 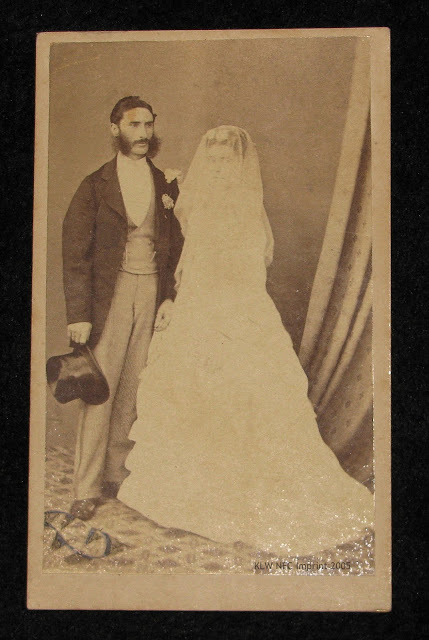 Wedding photograph, carte-de-visite. Verso is blank. Copyright © KLW NFC 2005-2009 ARR.